Unlike classical music, jazz is an art form with the emphasis primarily upon the performer, rather than upon the composer. The rise of be-bop in the 1940s increased the emphasis on improvisation, and further diminished the importance of the composer. It should come as no surprise, then, that only a handful of the most significant jazz musicians are known as great composers. Three names stand above the rest: Duke Ellington, Thelonius Monk, and Charles Mingus. The voice of Charles Mingus was much in evidence when the band dedicated to the preservation of his legacy performed at Hancher Auditorium on Saturday, January 20, 2001. As Mingus Big Band trombonist par excellence and bandleader, Conrad Herwig, said, "The amazing thing is that anyone can play his music and explore it – a swing player, a be-bopper, an avant-garde musician – and it still comes out Mingus." In impassioned representations of eight of the master’s compositions, the Mingus Big Band explored the many facets of the pen of the mighty bass player. The performance showed that Mingus’ powerful compositions provide an inspiring framework for improvisation, while still retaining the musical character intended by the great musician. What is even more amazing is that the Mingus Big Band’s spectacular combination of virtuosity and faithful representation of the composer’s intentions is accomplished with a roster of rotating personnel. As a result, Saturday night’s band had to prove itself without many of the best-known soloists from the organization’s most recent CD, including Randy Brecker, Earl Gardner, and Bobby Watson. But prove themselves they did. When Charles Mingus died of Lou Gehrig’s disease in 1979 at the age of 56, he left behind hundreds of compositions, many of which had never been recorded. In 1991, Sue Mingus, Charles’ widow, formed a big band to sustain the legacy of her husband’s music. While some ghost bands, like the current Glenn Miller Orchestra, exist to provide a nostalgic look back at music that was popular in a bygone era, the Mingus band exists to provide a living interpretation of Mingus’ music. The Mingus band showcases not only the compositions themselves, but also the workshop-like freedom Mingus gave his players to put their own personal imprint upon his music. This situation was very much in evidence Saturday night. The Mingus Big Band members, with Herwig at the helm, really "cooked" during their Iowa City performance, and they served up a delightfully rich smorgasbord of Mingus tunes, ranging from the most familiar to the rarely heard. Although Better Git It in Your Soul was relegated to the position of a tag at the end of the first half, other favorites like Goodbye, Pork Pie Hat, Haitian Fight Song, and Moanin’ were interspersed with thought-provoking lesser-known gems from their most recent CD, Blues and Politics. The concert began with a steaming version of Gunglinging Bird, Mingus’ homage to the seminal be-bop alto saxophonist, Charlie Parker. With the ease and grace of an equestrian master negotiating a difficult course, the rhythm section led the band through a series of rhythmic and feel changes that demonstrated the eclectic nature of Mingus’ composing. Brilliant solos by John Stubblefield on tenor saxophone, Walter White on trumpet, Peter Madsen on piano, and Jonathan Blake on drums set the bar high for the rest of the evening. The remaining soloists did prove, however, to be equal to the challenge in a performance that eventually included blowing time for each and every player of the band. The multi-layered excitement of Bird was an excellent demonstration of the freedom that Mingus gave his musicians, while still creating distinctive compositions. In keeping with the political theme, the band next performed Mingus’ sardonic Fables of Faubus, about Orval Faubus, the Governor of Arkansas who so vehemently opposed the court-required desegregation of the Little Rock schools. The band swung about as hard as you can swing, as alto saxophonist David Lee Jones laughed musically at the politician, and trumpeter Eddie Henderson’s solo gradually disintegrated into a humorous series of squeaks and squawks like clucking chickens. The saxophones contributed impromptu snippets of Dixie and Yankee Doodle, until finally We Shall Overcome led the piece to its bluesy conclusion. After the burning opener and the smoldering blues, it was time to cool things down with a ballad, this one a tribute composed the night of the death of the great tenor saxophonist, Lester Young. Goodbye, Pork Pie Hat began with a solid, unaccompanied improvisation by tenor saxophonist Craig Handy, with judicious references to Young’s signature Lester Leaps In. Pork Pie, which is in a subtly disguised twelve-bar blues-based format, enriched by chromaticism and substitute chords, benefited from the contributions of long-time MBB arranger, Sy Johnson. The unique rhythmic interpretation of the head and the occasional double-time feel gave the old standard a freshness unusual for a tune so oft-performed. Bassist Boris Kozlov was next to be featured, and he quickly demonstrated why he was worthy of holding down the bass chair in the master’s orchestra. With astonishing deftness, flawless intonation, a gorgeous rich tone, and inventive use of the instrument, including hammer-on technique and chording above the left hand, Kozlov quickly established his mastery. After eliciting shouts from the audience as he reached to the upper ranges of the bass, he settled into an uptempo version of the familiar vamp of Haitian Fight Song, and the band took off, even faster than it did on the CD, which, in turn, is still faster than the famous recordings Mingus made of the piece. Composed in tribute to the Haitian revolutionary, Toussaint L’Ouverture, Fight Song, was actually a composition that Mingus liked to use to represent his anger at the injustice of racism. Without a little research, one might think that Canadian saxophonist Mike Sim had lost track of that fact when he quoted from the opening theme of Dmitri Shostakovich’s lighthearted Festive Overture. In actuality, however, Sim’s musical reference was just the kind of sly, subtle humor Mingus himself might have interjected into the piece, referring obliquely to the fact that Sim was surrounded by Russians: Kozlov, who had soloed before him, and trumpeter Alex Sipiagin, who was to follow. When Sipiagin presented several choruses with only Madsen and Kozlov, the audience was transported to another emotional plane, one of tenderness and sorrow, before being gradually lifted back up with the entrances of first Blake and then the remaining horns. As the audience cheered for the exciting ending of Haitian Fight Song, the band lit into a quiet version of the closing phrases of Mingus’ ever-popular Better Git It in Your Soul, while Herwig introduced the band and announced the well-earned intermission. After intermission it was finally time to hear one of the most regular members of the Mingus Big Band, and one of Mingus’ best-known compositions. Baritone saxophone legend Ronnie Cuber swaggered up to the microphone to lead the band through Moanin’. After an extended solo by Cuber, we had our first chance of the evening to hear another of the great soloists of the Mingus Band, Ku-umba Frank Lacy. The rhythm section, lead by Blake, took on a funky beat for Lacy’s solo, and the horns responded with typical funk horn riffs. Madsen then was featured on piano before Cuber came back to the microphone, and with a few measures of unaccompanied baritone, turned the beat into a sizzling Latin number, which was then taken up by the band. Finally, on cue from Cuber, the beat returned to the original burning swing feel with which it had begun. In the mid-sixties Mingus adapted a text that had been written during the Holocaust, and created a timeless plaint against racism, indifference, and complacency. Don’t Let it Happen Here featured Mingus’ narration presented by John Stubblefield in a Mingus-like voice. This selection was leader Herwig’s opportunity to demonstrate his amazing chops. 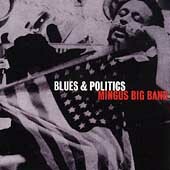 But, as appropriate for this evening, the real stars were Mingus’ music and his political sentiments. Though not quite as exciting as the performance I had heard them give in New York City with Mingus’ son Eric narrating, Don’t Let it Happen Here was a fine example of Mingus’ exceptional ability to combine his political beliefs with his compositional skills to create a moving and thought-provoking work of art. A somewhat less controversial political statement followed, featuring Lacy singing Mingus’ tongue-in-cheek blues, O Lord, Don’t Let Them Drop That Atomic Bomb On Me. This bluesy tune, with its subtle references to Nostalgia in Times Square and Blue Monk, served as a vehicle for both Lacy’s voice and his humor-laden trombone playing. The highlight of Ku-umba’s feature was an impressive full-chorus rising glissando with appropriate airplane motions by the band. Lacy’s improvisation elicited one of the more enthusiastic ovations from the large crowd. All night long the band played with a fire and a freshness that they might have been just beginning their tour. My first clue that maybe they had been on the road for a while came when trumpeter Eddie Henderson insistently and humorously quoted Gershwin’s There’s a Boat That’s Leavin’ Soon for New York, during his solo on the changes of Bomb. After the concert, Road Manager Albert Sun confirmed my suspicions, informing me that the band was on its way home after a concert the next day in Missouri. Henderson also quoted Gershwin’s more familiar Rhapsody in Blue during his solo, as well as the old swing standard, I’ve Found a New Baby. Soon the audience members were on their feet clamoring for more as Herwig reintroduced the band, and the players began to leave the stage. The enthusiastic audience response "demanded a recount" and brought the band back on stage for one final number. To close the concert, the band performed Mingus’ tribute to an earlier master of the string bass, Oscar Pettiford. OP was a burning, up-tempo, asymmetrical be-bop head tune, and gave Handy and Herwig one last chance to blow before calling it a night. The Mingus Big Band showed the amazing variety of Mingus’ compositional output. Their performances and recordings keep his music alive and fresh with respectful, but personal interpretations demonstrating three of the most common themes in Mingus’ music: his respect for musicians who preceded him, his love of the blues, and his political beliefs. His spirit loomed large as life in Hancher on Saturday, as his distinctive personality shone through on each and every lovingly presented composition and improvisation. Mingus would have approved. Despite the fact that Charles Mingus did not originally intend these tunes for big band, and that many of these players are too young to have played with the late master, this is literally the band of Mingus’ dreams: "Someday I’m going to have me a big band to record with . . . Man, the big band ain’t dead." No, and Mingus "ain’t dead" either. Long live Mingus! 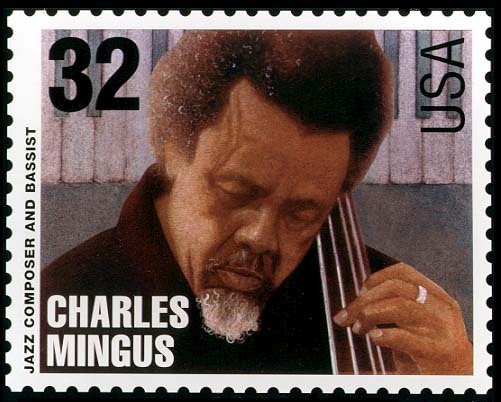 In 1995, after Mingus had been dead for sixteen years, the United States Postal Service issued a 32 cent stamp in his honor. I’m sure this was not the first time a jazz musician’s picture was in a post office. Modified by Tim Hicks, The-Webs Ltd. Copyright © 2001-2002, Coe College. All rights reserved.